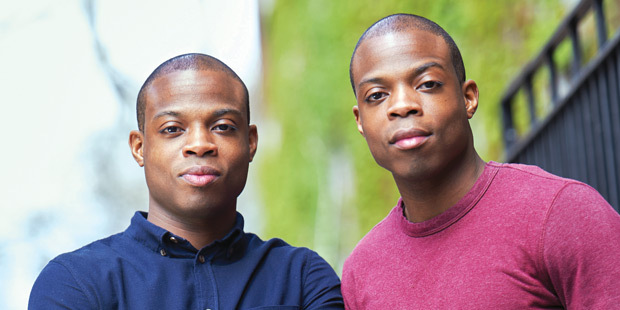 The Diggs brothers’ determination drove them from inner-city Detroit to Greenwich Village. As elementary students in Detroit, identical twins Raymond (pictured above, left) and Richard Diggs (right) were reminded annually that half their classmates would never graduate from high school, and just one student in each classroom would complete college. Their mother was having none of that. She taught them to imagine big and never to be limited by societal expectations. Indeed, for each twin, having the other to rely on as they journeyed toward professional careers was critical. “Our childhood was very rough, to be frank,” says Raymond. Their mother, Faydra, though chronically ill with diabetes, single-handedly raised five sons, including another set of twins, and insisted they work hard. Voracious readers, they admired Andrew Carnegie, Richard Wright, Bobby Kennedy, Bill Clinton, and George W. Bush alike. Now that the brothers are students again themselves, their 28 fellow AnBryce Scholars serve a similar purpose for them. “Having never been to New York, or to a private school, you’re a little worried coming in; AnBryce made that transition a lot easier,” Richard says. This year, he is a teaching assistant in Professor Helen Scott’s Corporations class. Despite the demands of the 1L workload, Raymond and Richard continue to mentor their TFA students through phone calls and Skype. They take study breaks to participate in the Black Allied Law Students Association and intramural flag football. Without coordinating, however, they somehow both ended up as Kirkland and Ellis summer associates. Together or apart, the twins agree that giving back to Detroit is in their futures. “A lot of wonderful things are happening in Detroit right now, but poverty is still a huge issue and the educational system is still struggling,” says Raymond. In the coming years, the brothers hope to understand how investment can spark business activity, private industry, and the health of cities. When they figure it out, they will be bringing those lessons home to Detroit.